Before I changed professions and ended up talking to computers all day, I use to be a line cook at a very popular Italian restaurant in my home town. I really did like cooking, I wasn’t so much into creating recipes, etc, but I really dug working on the line. There was a great satisfaction being in the TALL weeds of a busy night and me and the A-Team crew would crush the tickets and dominate the night. There was something special working like a team in a stressful busy restaurant. I remember one night, a fellow cook brought in Fu Manchu‘s “In Search Of…” album and I was blown away. A short time later, I picked up “The Action is Go” and “Eatin’ Dust” albums. I officially became a fan of the band. In the kitchen there was my friend Jimmy (who is the same Jimmy that does the demos here) as well as another cook that played drums. We started joking around that we should form a Fu Manchu tribute band and play a show or two. The stupid band name ‘!Tra-Bang!’ popped out in the middle of one of our shifts and we started practicing for a gig to lay down some Fu and melt some faces. The gig was awesome and we even laid down a few tracks to document our efforts. A few years later, Fu Manchu actually played Missoula, which was great to finally see the band up close and personal. I remember being right in front soaking in the fuzz and kick drum. Fast forward a few more years to today, and I sit here now reading answers to gear questions I sent to Bob Balch about effects. I think that is pretty cool indeed. 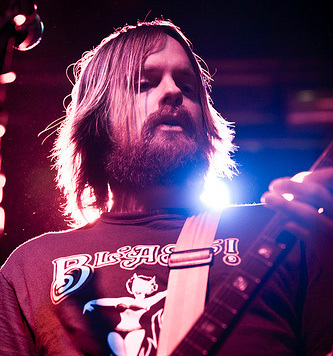 Bob Balch is not only in Fu Manchu but also runs PlayThisRiff.com which is a site to learn how to play riffs by heavier bands, and are usually taught by those guitarists themselves. Bob also does lesson videos on the site breaking down scales and techniques. If you’re interested in learning some riffage or working on some heavier solos, etc. that place is a great resource! Additionally, he teaches guitar at North County Guitar Lessons in the San Diego area and offers in house and/or private skype lessons! – Over the years, when I think of Fu Manchu, I think fuzz. What fuzz pedals have been on your board or used in the studio throughout the years? I started with a regular Fuzz Face. I used that for years. Then I tried a Vintage Tone Project Fuzz. I had one custom made and the dude put my pic on it. Funny. Now I play a Creepy Fingers Creepy Face. I’ve used tons of different ones in the studio, but those are/were my main live ones. – Currently, I see that you’re using the Creepy Fingers Fuzz. 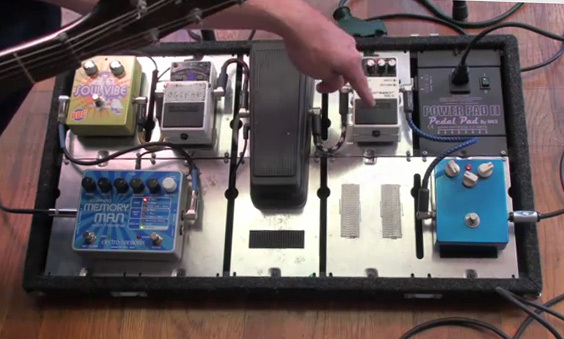 What did Brad Davis do right to the fuzz that makes this *the* fuzz on your board? It has tons of gain but doesn’t get muddy. And it doesn’t feedback much either. I always wanted to most amount of fuzz with the most clarity. – Is that Creepy Fingers Fuzz a prototype, or standard issue. Can anyone get that same exact fuzz? You can get the same, but I have #1!!!!!!! – Have you always been a germanium type of fuzz dude, or did you dabble in some silicon based transistors in the past? Rarely. If it sounds good though I’ll play it. – In my experience, you can get some pretty crazy reaction with a buffer in front of the fuzz. Have you ever explored that? – Have you considered having multiple fuzzes on the board for different tone options? Yes, but I haven’t yet. I just recently got a pedal board with power. I was going old school with 9volts for years. More pedals in that respect = more crap to worry about in my opinion. – Why do you prefer the fuzz to be the first pedal in the line? For a bigger sounding Wah. – When I look at your board, I like the simplicity. Fuzz, Wah, Delay, Phase. I can see how this is perfect for Fu Manchu. Do you have other projects (or even with PlayThisRiff.com) that you need a board with more variety? I have been working with tap tempo pedals a lot more with my own stuff. PlayThisRiff.com is mostly other bands showing what they play, so anything goes there. – After your fuzz, you have the Boss NS-2 noise suppressor. Is there a particular reason why you have that in that location? If it is on the other side of the wah it takes away a ton of sweep. I learned that the hard way after buying a new wah. Damn! – In the past you use to ride the MXR Phase 100, but now you’re using the BBE Soul Vibe. What caused you to change? And why did you pick the BBE Soul Vibe? BBE gave me that, and it sounds killer. I originally used a MXR that I bought off of J from WHITE ZOMBIE. After touring with WHITE ZOMBIE and FU MANCHU that Phaser got phased out. Our singer still plays his MXR though. – If memory serves me correct, you use to run the phaser through the effects loop. What were the pros/cons of going through the effects loop with the modulation? It just sounded more intense with the Marshall 2000. I used to play an 800 and it didn’t need the loop. – Have you ever placed the delay in the effects loop? Yes. I like it both ways for different reasons. – You’re currently running the Electro-Harmonix Memory Man w/Hazarai.. a great sounding and feature rich pedal for sure. What other delays were in the line up in the past, and how is this Memory Man superior to those other delays? I had a MXR carbon copy, and a Boss Digital Delay. I used to have a Washburn Analog too. The Memory Man is by far my favorite. I still discover new sounds on that thing after 1 year of touring with it. – What amp(s) are you using right now? – For someone interested in playing heavier music, and wanting to pick up some effects, what would you recommend as a good introduction? – Here are some EffectsBay staple questions that I like to ask…If you could only keep one pedal on your board, what pedal would that be? and why? The deserted island question. Probably the Fuzz in FU MANCHU. Delay otherwise. – What pedal on your board do you not like, yet it consistently remains.. and you have no idea why? If any? None really. They all serve a purpose. – What pedal on your board, if any, would you like to upgrade or try something different? Wah for sure. I’ve had it modded before, but I never tried any other ones. Oh wait, Lightning Bolt wah I think it was called. That thing is rare and badass. I used it on the intro to the FU song “Webfoot Witchhat.” Check it out! Thanks Bob! Make sure you follow PlayThisRiff on Twitter and ‘like’ them on Facebook for daily lessons and news! That Power Rad II Pedal Pad board the pedals are mounted on looks pretty cool. Anybody know anything about it?